Four political science students at the University of New Brunswick in Saint John want to make a positive impact on the world around them. Thanks to the generous financial support of the Sandra Irving Scholarship, they are well on their way. Laura Fitzpatrick, Michael Gooding, Ryan O’Connor and Mark Smith have each been awarded a $5,000.00 scholarship to help them achieve their objectives. 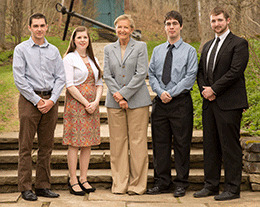 “This scholarship acknowledges the academic and personal achievement of these students and seeks to ensure that they will be able to carry on successfully in their work,” said Thomas Goud, chair of the Sandra Irving Scholarship selection committee. The Sandra Irving Scholarship is awarded annually to political science students at UNB Saint John on the basis of academic achievement, career aspirations and candidates' statement of the scholarship's value in reaching career goals.